She could look up Manny (from ESB). Is Florida the Queensland of the States? Or is Queensland the Germany of Australia? Or is Germany the Florida of Europe? I always try to explain queensland to americans as "its our deep south but in the north east"
Tasmania is not really Australia though, to be fair. Like, I can understand her getting all the credit if she was the supervisor of the project, but she wasn't. I mean coding is not the tough part, which people are getting mad that the kid that wrote so much of the code isn't getting credit. It's starting the project and having the idea. As it has been stated, she wasn't the supervisor. It was some guy name Shephard if I recall correctly from the video. She was part of a huge team of scientists. Also, she did nothing to correct everyone! Yeah, she said my team was helpful, but if I saw the media giving me all the credit, I'd bow my head to the supervisor of the project. Where does she get all the credit ? Most of the serious articles I read on the topic explained her role pretty accurately. Of course some media see the interesting aspect of the story as that of a young woman, a grad student, playing an important role in a major 'STEM' project, and that's what makes news. Hardly grounds for posting a video created by a a dude associated with losers like the MGOTW movement. You're doing quite well yourself in a STEM field. Suppose you played a significant role in developing some new and very significant polymer some time down the road, and the sensationalist media published something about a Latino scientist (grad student) being an important part of the project, with your beaming picture included, how would you feel if some white supremacist, pissed off and incredulous that such a thing could happen, peppered the internet with videos and other content, belittling your contribution ? They did contribute Ricky Ponting, though. But also Martin Bryant. So probably a wash.
She gets all of the credit by the media focusing in on her. Look at CNN's article's headline, ffs. It's hugely disrespectful to focus in on one scientist and give thanks to that one person. It's downplaying other's roles. I've read on Twitter a scientist that worked on the project correcting the record. There were 4 supervisors and one main supervisor it seems. She created one of 3 algorithms, IIRC, that were used. If I were one of the 4 supervisors, I would be pissed if the media focused on one of us in this manner. As I said, I could totally understand if she was like my committee chair where she came up with the idea and just doled out the work. This is the nature of research where the person with the idea gets all the credit. As for your second question, it depends on how the media frames it. If they frame it like "this is a scientist that is Latino working on so and so" I wouldn't mind it. If they frame it like "thank this Latino for the polymer" yeah, I would agree with what the white supremacist said if I were one of 4 supervisors on the project. Look, for my thesis, I spent 99.9% at my supervisor's lab. He taught me everything I know. I give all thanks to him, all respect. I'm not sure if I talk about him much on here, but the man is very special to me (no homo). I give him all the credit because he made me the person I am today (he's a straight white male, btw). When I went to interview at all those medical facilities and universities, I made sure to tell them that he is my inspiration and deserves all the credit for my project. Yeah, it was a back-breaking project that I did all the work on, but at the end of the day, he made my work possible by accepting me into his lab and allowing me to work on this project. So yeah, I would make damn well sure that the media knows that this straight white male made everything possible and deserves the most credit. "Junior members like Bouman made significant contributions to the project, he added. Of course, senior scientists worked on the project, but the imaging portion was mostly led by junior researchers, such as graduate students and post docs. To anyone who read the entire article, the limitations of Bouman's contribution were apparent. Another CNN article posted the same day by an actual science writer, made no mention whatsoever of Bouman. The journal "Science" (the official publication of the American Association for the Advancement of Science Science) made no mention of Bouman. 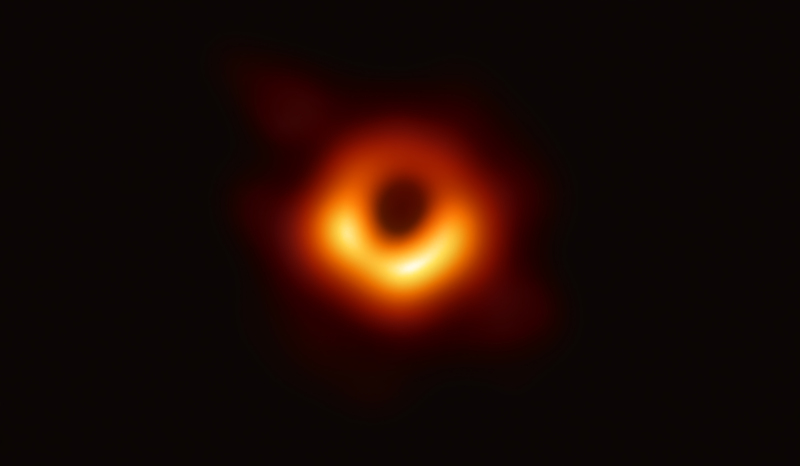 The Event Horizon Telescope’s global network of radio dishes has produced the first-ever direct image of a black hole and its event horizon. Two leading astronomy publications similarly made no mention of Bouman. The Event Horizon Telescope has released the first-ever image of a black hole. This image will provide unparalleled insight into these mysterious, exotic, and invisible objects. It's hardly her fault if the less-than- scientific general interest media chose to focus on the fairly rare notion of a woman and a grad student playing a role. It certainly didn't justify the internet bombardment reaction. This reaction ranged from the innocent correction of a mistaken impression all the way to the wildly misogynistic ravings of assorted malcontent losers. Of course the more senior members of the team deserve credit, and they get it in the serious journals that do not mention Bouman. Like the man-bites-dog stories, the casual media focus more on the unusual than on the run of the mill. haha I guess they really really don't like outsiders.